Living in a foreign country, I’m well aware that on a day-to-day basis my actions are viewed as somewhat absurd by those around me. The sideways stares and furrowed brows have become a bit of the background music to my life. This weekend was no exception. 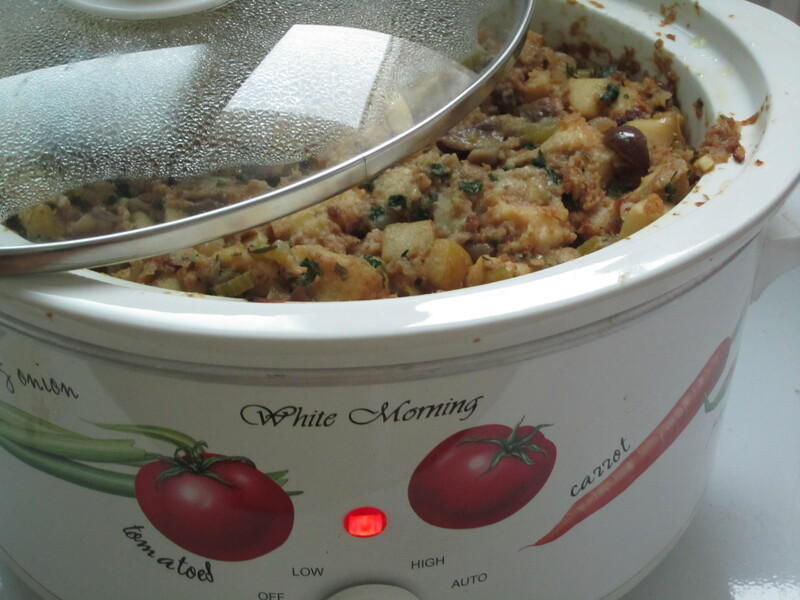 With ovens being a bit of a commodity here, the silent partner for this whole ordeal was to be my slow-cooker. Factor in the need for specific ingredients, a 5 hour bus journey, two transfers, and a 20 minute walk and we’re looking at a daunting venture. I was met with a few firmer stares than usual as passersby glanced in the direction of the stifled grunts along the way. I guess a redhead heaving under the weight of canned goods isn’t as common as high heels on a hike. Having served time with hard labor upon arrival, putting the finishing touches on my stuffing felt like a walk in the park. I’m happy to report that the slow-cooker worked fabulously as an incubator of gooey goodness. This Thanksgiving, I’m thankful to our founding fathers for adding gluttony to the national agenda. Yes, folks, it has arrived. The only time of year when the elastic around your waist is praised as ingenious rather than scorned as geriatric. Cover a table with dozens of Mom’s recipes, ample spirits, add some football for good measure and you’re standing right next to the Dhali Llama in line for karmic enlightenment. Some of you may settle for a big chicken. Some of you may forego the green bean slop we all love to hate. I, however, am not one of those people. There will be green bean casserole. There will be cranberry sauce. And by Gl-tton, there will be pumpkin pie. This year, I have taken on the responsibilities of stuffing and pumpkin dip (courtesy of fellow WordPress bloggers Haute Apple Pie). Now, stuffing is one of those things not to be messed with. Some people were weaned off the bottle with sausage in their stuffing. Others swear up and down that slimy, salt-saturated surprises called canned oysters are the secret ingredient. In my house, we prefer to keep it simple. Over the years, our standard go-to has come of age and left Pepperidge Farm in its dust with the additions of fresh rosemary, roasted chestnuts, and caramelized onions to deepen the flavor. It all starts with good bread. At home, through trial and error, I have decided that fresh sourdough lends itself best to the final product. While I like challenges, I also know when to hang up my hat. This isn’t San Francisco. Paris Baguette’s “Fresh Homestyle” will work just fine. On Sunday, I set out on the first step of my journey towards the light. After stocking up with 4 loaves of bread, I headed for a friend’s who kindly offered to share her oven. With help, we had all 4 loaves neatly cut into uniform cubes in under 30 minutes. The toasting process, however, was not quite as concise. Complete with a miniature baking sheet and spastic fuse, needless to say, the toasting took a few rounds. About 32. After a few months (and a few run-ins) on the trail of fresh rosemary, I purchased a small plant of my own a few weeks ago. Done, and done, you say? While rosemary has a reputation for being a bit fussy and I have a reputation for turning things brown, I was a little worried about this one. Fingers crossed, I think we’ve made it. That is, unless I cut the sprigs off this evening and every last leaf ends up on my patio floor. Let’s think positive. Fresh parsley was secured with help the of NH (previously mentioned) and ample chicken bouillon was scoured from the hidden corners of HP. While chestnuts gave me a bit of a run for my money, we’re locked and loaded. Stay tuned (and maybe cross your fingers). Preheat oven to 400°F. Spread bread cubes in single layer on large rimmed baking sheet. Bake until golden brown, stirring occasionally, about 15 minutes. Transfer to large bowl; cool. Melt butter in heavy large skillet over medium-high heat. Add onions and sauté 10 minutes. Add rosemary; sauté until onions are golden brown, about 10 minutes longer. Add celery and sauté until beginning to soften, about 5 minutes. Add chestnuts and stir to blend. Transfer onion mixture to medium bowl. Mix in parsley. Add broth to skillet and bring to boil, scraping up any browned bits. Add to onion mixture. (Bread and onion mixture can be made 1 day ahead. Cover separately. Store bread at room temperature; refrigerate onion mixture.) Stir onion mixture into bread. Season with salt and pepper. Mix eggs into stuffing. Loosely fill main cavity with cool stuffing. Butter glass baking dish. Spoon remaining stuffing into prepared dish. Cover with buttered foil, buttered side down. Bake stuffing in dish alongside turkey until heated through, about 20 minutes. Preheat oven to 350°F. Butter 13 x 9 x 2-inch glass baking dish. Transfer stuffing to prepared dish. Cover with buttered foil, buttered side down, and bake until heated through, about 30 minutes.